As someone who homeschooled for over 22 years, I know the frustrations of looking for science resources. I searched for solid science with biblical creation as a foundation, but the few books I could find often appeared boring, lacked convincing science, or contained drab images. Homeschool parents understand the dilemma—we want accurate content, but we also want a resource that will draw our kids to the truth. We want them to be fascinated with the amazing world God has created! But if the book is unappealing, the kids will only spend mandatory time with the pages open and do only what is required. To motivate my kids to love science, I sometimes purchased secular books with evolutionary teaching simply because the illustrations were stunning. I actually used a marker to black out sections or told my kids “ignore that part” when they came to the “millions and billions of years” teachings. And while it wasn’t hard to convince my kids that we didn’t come from apes, some things were confusing to them and too difficult for me to explain, such as dinosaurs living with humans, the Ice Age, and starlight and time. I searched for a beautifully-illustrated, cutting-edge science book with creation truth—one with fun facts and amazing images that would compel my kids to turn pages. 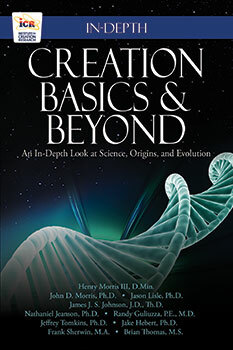 I’m thrilled to tell you that the ministry team at the Institute for Creation Research kept you in mind when we developed our book Guide to Creation Basics. ICR’s Guide to Creation Basics is elegantly produced and powerfully presented. The favorite dogmas of evolutionary theory are boldly examined and dismantled with clear logic and simple facts—starting with the obvious truth that God’s handiwork is clearly visible everywhere. Whether we look through a telescope, a microscope, or with our own unaided eyes, what we see is a universe filled with incontrovertible evidence of God’s ingenious design, His magnificent glory, and His vast power. This book sets forth a generous sampling of that evidence, making a vivid and compelling case for the biblical account of creation. This is an invaluable resource for students, teachers, or anyone confused by authoritative-sounding skeptics. The Origin of the Species: Did Darwin Get it Right? Ape-Man or Image of God? Please visit our website www.ICR.org/store or call 800.628.7640 to order your copy of this incredible new resource. It’s also available for the Kindle, NOOK, and through the iBookstore. For those who are visually impaired or prefer to listen to books, the Text-to-Speech option is available on the Kindle version. 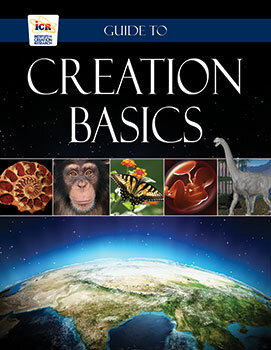 We hope you’ll like both Guide to Creation Basics as well as Creation Basics & Beyond: An In-Depth Look at Science, Origins, and Evolution so much that you’ll spread the word! Cite this article: Durant, J. 2013. Our Newest Resource Offers an In-Depth Look at Creation Issues. Acts & Facts. 42 (9): 4.